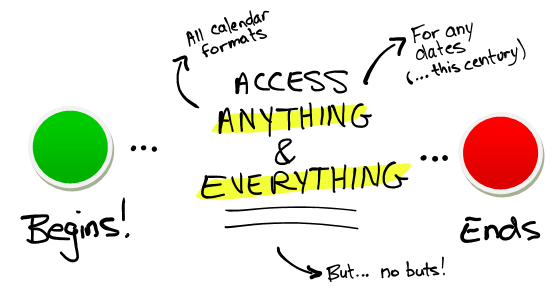 How does Full Access work? While active, you can access all calendar formats for any dates this century. This means you can plan for any period, today. Save 25% after the first year	with automatic renewals. You're in complete control, you'll get a reminder email, and you can cancel anytime. Who Needs You to be Dependable? Your family, your colleagues, and yourself too, right? And how do you make yourself more dependable? You start by writing things down. Now, you can do that, day after day, on your own just-right printable calendar format. With the Full Access Membership, you get the printable calendars you need, complete and ready-to-print for any dates you choose. Calendars that print exceptionally well, as many helpings as you need. And they're easy to use. Do you have the skills to print a Microsoft Word document? (Try it!) And you got a pen? Then, you're set! If you don't get the results you were going for, email me for personalized help or a refund, and you will find care, I promise. Your purchase comes with a 60-day money-back guarantee. So, try the calendars, then decide. Sound fair? I have been getting your monthly calendars for several months and I just made the leap to a membership. I feel so on the way to getting organized. Well now I can see what I am doing and actually save some time for more things I love to do by NOT overbooking! Thank you so much! Did you know that CalendarsThatWork.com is a one-man show?